Cristiano Ronaldo’s ended his 9-year spell at Real Madrid on Tuesday as he signed a 4-year contract with Juventus for a £105m fee. The Portuguese star will earn £500,000 a week with Juventus and will stay there for the next four years, still repeatedly putting the ball in the back of the net. During his time at Madrid, Ronaldo scored 450 goals in 438 games, while he also won 4 Champions League title (3 on the trot) and 4 Ballon d’Ors. For someone who has scored so many goals, to pick 5 is a task in itself, but here are the top 5 goals scored by the ex-Madrid talisman during his reign at Real Madrid. Number 2 on our list is his goal against rivals Barcelona during Copa Del Rey 2017-18 fixture at Santiago Bernabeu. That counter-attack and burst of pace is trademark Ronaldoesque. You give him half a chance, he will leave you stunned. 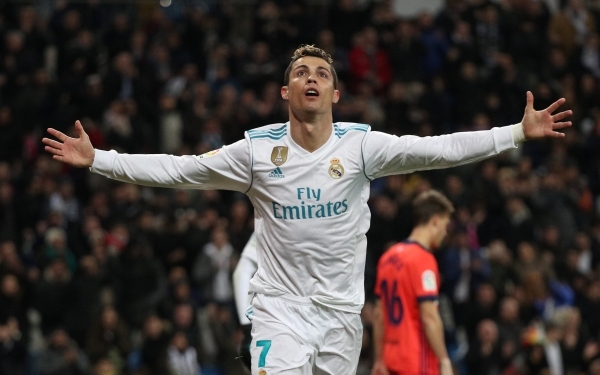 Ronaldo volleys one against Atletico Madrid in a Liga fixture in 2018. Here’s one from 2011 against Sevilla in Spain’s La Liga. An absolute screamer! Another one from 2012 and this one is pretty good too. I bet Gerard Pique could tell you a lot more about this one.